Pacific Rim opens with two definitions appearing on the screen in a retro-futuristic green font: one for the word 'Jaeger' - the giant robot-like, human controlled battle suits - and the other word, 'Kaiju' - the inter-dimensional beings that travel through a rift in the Pacific Ocean and so often threat the future of the human race. And with that information made known from the get go, we have our set up and the action well and truly begins. Connected to their robot exoskeleton and their co-pilot through a mind link that make all three act as one, it is up to the pilots within the giant Jaeger Rock'em Sock'em Robots to battle off category-3 monsters and their own inner-demons to save Earth from a threat that dates back to pre-historic times. 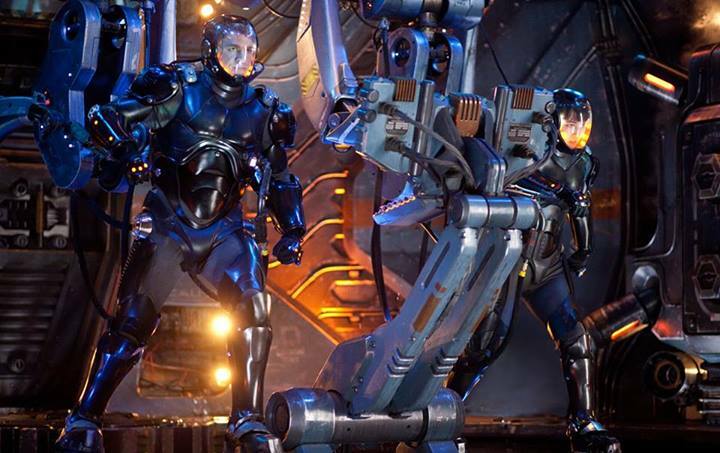 Jaeger pilots bring a physicality and vulnerability to Pacific Rim's ambitions action scenes. What sets Pacific Rim aside from other recent genre films from the Michael Bay generation of filmmaking is the focus on the film's characters. In a similar vein to a film like Top Gun, the friendships, relationships and brotherhoods between the Jaeger co-pilots who march into battle together brings a depth to the film and its characters, who when joined together through the mind-link process (which allows the pilots to access the inside of the other's mind and access their personal memories and thoughts) only strengthens this depth through an interesting philosophical idea which is there for anyone who wants to consider it. As a result of this concept, we do not get a film about giant robots - as large metal beings who cannot suffer and feel no pain - but the vulnerable human pilots at the centre of both the suit, and the film; whose presence and personality adds a drama, engagement and sense of peril to the film's large scale fight sequences. Through the premise of the pilots fighting through the suit also comes a large physical element too, as we witness not just a giant battling 'bot hitting the monstrous creatures from the deep, but the puppet-master human pilots themselves simultaneously doing the same moves too. As a rule of thumb, genuine human fight scenes will always be more effective than CGI, so pair that conceit with the various other physical fighting scenes that the film features, and suddenly a film that was initially doubtable is actually a lot more entertaining than you might expect it to be. Lead Charlie Hunnam in one of Pacific Rim's CGI-free fight scenes. Yet I'm going into a lot of analysis here, and there is reason to question whether or not this level of critical interpretation is even necessary. To bring it all down to what really matters, Pacific Rim is simply a lot of fun to watch. Very well-paced and by no means overstaying its welcome, the film is an exciting action romp that does the job of keeping its audience both entertained and feeling like a child again (if they are not one already). There is no two ways about this; this film is a guilty-pleasure summer blockbuster indulgence that deserves to be seen on the biggest screen possible. The monster movie genre has died away somewhat in recent years, and judging by this and the upcoming Godzilla reboot (by Monsters director Gareth Edwards) this is the start of a fresh, stylish and contemporary yet retro homage to a genre that is currently resurfacing like the monster threats that it features. You'd be forgiven for having a total lack of interest for Pacific Rim after witnessing the trailers that cry out to the audience that made Michael Bay's Transformers films into a billion dollar franchise. Yet the end result is in fact a highly entertaining adrenaline ride that knows exactly what it needs to do to be a fulfilling summer blockbuster, and achieves it. 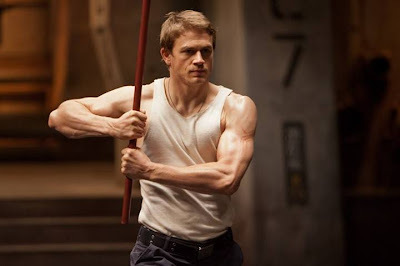 Of course it has its moments of CGI fighting and destruction - it would be a rubbish monster movie if it didn't - but Pacific Rim proves that despite some particular examples of recent years, this is not always a bad thing. At the film's centre are the people inside the giant metal suits and their stories that drive the narrative and bring drama and engagement to these big blockbuster set pieces, which are as enjoyable as they are ambitious. Indulgently stylish and absolutely epic in every sense of the word, Pacific Rim is every bit as good as you'd hope it is, and not at all as bad as you feared it might be. Pacific Rim (certificate 12A) is released in cinemas across the UK on July 12th. Are you looking forward to seeing Pacific Rim? Perhaps you already have? Leave your thoughts and opinions in the comments section below! Labels: Guillermo del Toro, Pacific Rim, Review, Warner Bros.